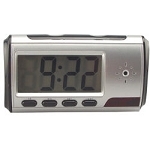 This clock will easily blend in anywhere; only you will know that it is actually a DVR recording sight and sound. It is perfect for covert surveillance. With just a push of a button you can record approximately 90 minutes of 640 x 480 video in AVI format at 30 FPS with the included 4 GB micro SD card (will support up to 16GB). 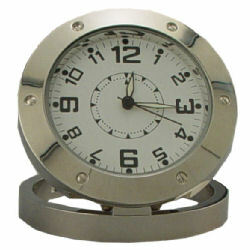 This clock will easily blend in anywhere; only you will know that it is actually a DVR recording sight and sound. It is perfect for covert surveillance. With just a push of a button you can record approximately 90 minutes of 640 x 480 video in AVI format at 30 FPS with the included 4 GB micro SD card (will support up to 16GB). Or, to save battery life, the DVR520 is the first clock DVR with a built-in motion detector. The motion detection feature allows you to record only when something is happening. This clock DVR is also a 5 megapixel (1280x960) camera that will take still pictures in JPG format. To view the video just connect the clock to the USB port on your computer and you are ready to see the video with Windows Media Player or pictures using your favorite JPG viewer. 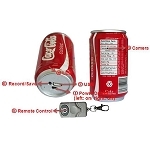 This item can also be used as a web cam using the included driver. It includes the USB cable for connecting to a computer and CD with PC camera driver. The clock measures 2 and 5/8 inches by 7/8 inches by 5/8 inches and flips up to a maximum height of 3 inches. 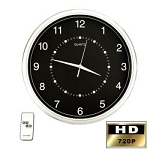 The clock operates on a built in high capacity lithium polymer battery that will operate the DVR for approximately 120 minutes of continuous use. It will be recharged when hooked up to a computer. Please note that it is the responsibly of the customer to check all State, Local and Federal Laws governing the use of video Spy (hidden) cameras (with or without audio) before ordering and/or using hidden or covert video and/or audio surveillance equipment. In most states, hidden video surveillance is legal, as long as it is not done in an area where reasonable privacy is expected. These areas include, but are not limited to, bathrooms, bedrooms and dressing rooms. In most states video surveillance does not require the consent of parties involved. However, in some states, the use of audio recording or surveillance requires the consent of all parties involved. There are also various Federal and State Laws regulating the use, and possession, of some types of audio surveillance equipment. We recommend that you check all State, Local and Federal Laws regarding the use of video Spy (hidden) cameras with or without audio.